The deficit of Ukraine's national budget in November 2013 was estimated at UAH 5.68 billion against UAH 5.61 billion in October 2013, Ukraine's Finance Ministry reported. The deficit in November 2013 was 29.2% down from November 2012. From January to November 2013, the budget deficit grew by 12.8% and amounted to UAH 46.5 billion. The deficit of the general fund of the national budget in November 2013 alone expanded by UAH 6.61 billion, to UAH 50.48 billion. The revenues of the general fund in November 2013 amounted to UAH 25.05 billion, which was 1.5% up from October 2013, but 12.7% down from November 2012. The special fund of the national budget in November 2013 received UAH 5.08 billion against UAH 3.28 billion in November 2013 and UAH 3.4 billion in November 2012. The amount of value-added tax refunds in November 2013 grew to UAH 5.65 billion from UAH 3.28 billion in October 2013 and UAH 4.2 billion in November 2012. The revenues of the general fund in the 11 months of 2013 were UAH 266.43 billion, which was a mere 2.8%, or UAH 7.2 billion, up on the same period of 2012. 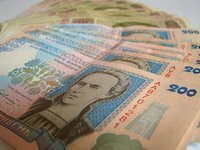 A total of UAH 42.38 billion was funneled into the special fund in January-November 2013, which was 8.6%, or UAH 4 billion, down year-over-year. Due to a shortfall of budget revenues, Ukraine's parliament late in December 2013 amended the national budget for 2013, having reduced the revenues by UAH 19.4 billion, or 5.2%, to UAH 370.56 billion. In particular, the revenues of the budget's general fund were cut to UAH 304.48 billion. At the same time, parliamentarians raised the deficit of the national budget by the similar amount, to UAH 69.98 billion. The reduction in the revenues was balanced by borrowings worth $3 billion from Russia, which was agreed by the Ukrainian and Russian presidents on December 17, 2013. Thus, the annual target of budget revenues in 2013 in the 11 months was fulfilled by 87.9%. The general fund's revenues target was executed by 87.5%. To secure the 100% target, the national budget in December 2013 had to receive UAH 42.4 billion in revenues, including UAH 38.1 billion for the general fund.